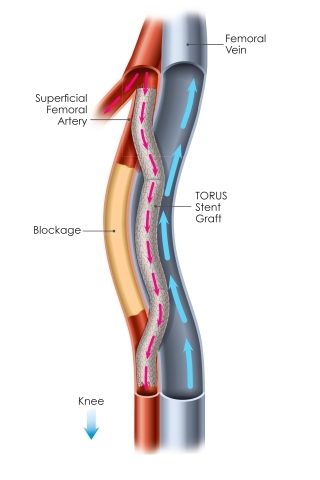 SUNNYVALE, Calif.--(BUSINESS WIRE)--PQ Bypass, a clinical-stage medical technology company that has developed the DETOUR procedure, a novel treatment for long (>15 cm) superficial femoral artery (SFA) blockages, announced enrollment of the first patients in the pivotal DETOUR II Trial in the United States. The trial is a prospective, single-arm clinical trial designed to evaluate the DETOUR™ System for percutaneous femoropopliteal bypass. The study will enroll up to 292 patients at up to 40 centers in the U.S. and Europe with patient follow-up out to 36 months. The trial also includes a prospective economic study to collect quality-of-life outcome measures and cost data, including rehospitalizations. Vasili Lendel, M.D. and André Paixao, M.D. initiated the DETOUR II trial in the U.S. at Arkansas Heart Hospital in Little Rock today, enrolling two patients with complete blockages in the SFA longer than 30 centimeters. Enabled by PQ Bypass’ patented DETOUR™ System, the DETOUR procedure creates an endovascular bypass, using proprietary stent grafts, that originates in the SFA, travels through the femoral vein, then returns into the popliteal artery. This new pathway is designed to re-direct oxygen-rich blood around the diseased part of the vessel, restoring blood flow to the lower leg and foot of the patient. The lack of an optimal treatment alternative for long-segment femoropopliteal occlusions is a persistent issue for patients with advanced PAD. Published literature has demonstrated that conventional endovascular approaches result in at least 30 to 40 percent lower patency in these blockages when compared to the same treatments used for shorter lesions1,2. Studies have also shown that these patients could experience a 40 percent rate of re-treatment within 12 months3. Worldwide over 200 million people have PAD4, a serious circulatory condition caused by a build-up of arterial plaque, most commonly in the SFA and popliteal arteries5. As this disease progresses, it results in longer and harder to treat occlusions, known as complex femoropopliteal occlusive disease. Current treatment options are not ideal; open surgery is associated with increased rates of complication, while approved endovascular therapies can result in additional re-treatments6. If left untreated, femoropopliteal occlusive disease can lead to gangrene and limb amputation. PQ Bypass, Inc. is a Silicon Valley-based medical device company developing the DETOUR procedure for percutaneous femoropopliteal bypass. Our proprietary DETOUR™ System is a physician-driven innovation, created by Dr. James Joye, and Dr. Richard Heuser, who are world-renowned experts and pioneers in the treatment of peripheral arterial disease. In March 2017, PQ Bypass received CE (Conformité Européenne) Mark approval for the DETOUR™ System. In August 2017, Frost & Sullivan recognized PQ Bypass with the 2017 European PAD Interventions Technology Innovation Award for the DETOUR procedure. In November 2017, PQ Bypass received conditional approval of their IDE for the DETOUR™ System. 1 Hong, Sung-Jin, Young-Guk Ko, Dong-Ho Shin, Jung-Sun Kim, Byeong-Keuk Kim, Donghoon Choi, Myeong-Ki Hong, and Yangsoo Jang. “Outcomes of spot stenting versus long stenting after intentional subintimal approach for long chronic total occlusions of the femoropopliteal artery.” JACC: Cardiovascular Interventions 8, no. 3 (2015): 472-480. 2 Taneja, Manish, K. H. Tay, M. Sebastian, S. Pasupathy, S. E. Lin, T. Teo, R. Low et al. “Self-expanding nitinol stents in recanalisation of long-length superficial femoral artery occlusions in patients with critical limb ischaemia.” Singapore Med J 50, no. 12 (2009): 1184-1188. 5 Kasapis, Christos, and Hitinder S. Gurm. “Current approach to the diagnosis and treatment of femoral-popliteal arterial disease. A systematic review.” Current cardiology reviews 5, no. 4 (2009): 296-311. 6 Morbidity of Femoropopliteal Bypass Surgery. van de Weijer MA, Kruse RR, Schamp K, Zeebregts CJ, Reijnen MM Semin Vasc Surg. 2015 Jun; 28(2):112-21. PQ Bypass announced enrollment of the first patients in the pivotal DETOUR II Trial to evaluate the DETOUR System percutaneous femoropopliteal bypass.